What kinds of cabinets are good for a classroom? 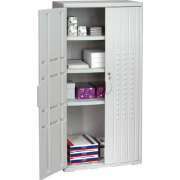 Plastic storage cabinets are great for a classroom, office or storage space. 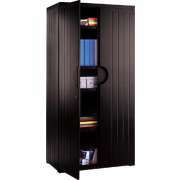 Durable and attractive designs including sturdy shelving can fit where and what you need. When it comes to keeping any space organized, having the right cabinets makes a big difference. Plastic cabinets have a lot of advantages. They are low-maintenance and easy to clean so keeping them looking nice is no big deal. They open easily and quietly so you don’t have to disturb lessons or work to get access to what you need. With a selection of configurations, you can enjoy the benefits of Hertz Furniture’s great selection in a variety of spaces. What are the benefits of plastic cabinets? There are many benefits to plastic cabinets. Although steel is sturdy, it tends to be clunky and noisy when opening and closing. Plastic cabinets have a more subtle professional appearance and generally open and close quietly. They are more conducive to a classroom or professional setting than many of the alternatives. Plastic storage cabinets also tend to be much lighter than steel, which makes them easier to move around when you are rearranging your space or repurposing them. Although they may weigh less though, they still have sturdy shelves which can support high weight capacities. Before making your selection, it is important to make sure that the shelves will fit what you intend to store on them. What is the best size for plastic storage cabinets? There is a reason utility cabinets come in so many different sizes. It’s because there is no one option that is ideal for everyone. The right choice really depends on your space and needs. Because you never know what you might want to put in your cabinet in the future, the best idea is to choose the option with the most space that will fit nicely in your allotted area. Of course, it helps that most models have adjustable shelves which allow you to accommodate all kinds of different supplies and materials. 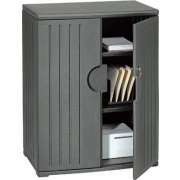 Are plastic storage cabinets with doors secure? Our plastic cupboards have built-in locks for convenient security. This makes it easy to ensure that your supplies stay put and protected. If you want to leave the cabinet open or unlocked, that is always a possibility, but having the option of locking is great because you never know when you might want to take advantage of it. It is much easier to have a locking plastic cabinet from the beginning than it is to try adding an option for a lock later.